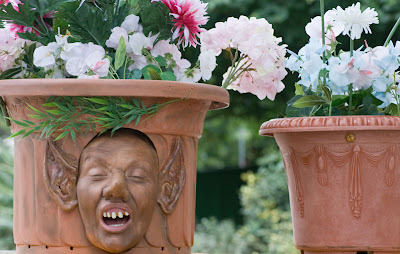 We have Royals who chat to trees and flower pots that chat and sing to us. Whoever said the English were eccentric? Now that is very unusual! Singing helps the flowers grow. How do you always end up in the right place to take interesting pictures every day ? This one made me laugh so thanks for that. I hope you are going to be photographing some of the Plinthers ? Anyway, this was todays most unique thing/photo I have seen on CDPB. Funny one! A bit scary though! I don't know who said it, but they ARE!!! Funny flower foto! Martians have invaded London? Scary, but fantastic! I like it! That is just weird! Actually a bit creepy! I think I would absolutely freak out if I ran into this unexpectedly!